The VitaElegante collection by MARAZZI is a glazed porcelain tile portrayed as a modern interpretation of classic stones. VitaElegante Ardesia is a 12 in. x 24 in. porcelain tile that captures the effect of distinct clefts, mineral deposits and the effect of randomly layered color found in natural slate. Available in a large format with minimal pattern repeat, it can be installed on both floors and walls for an elegant style upgrade to any decor. Softened and burnished to a lustrous finish, the tile features shades of green, blue and rust that support the warmth of nostalgia coupled with modern color harmony. 15.6 square feet, 8 pieces per case. Case weight is 64.8 lbs. 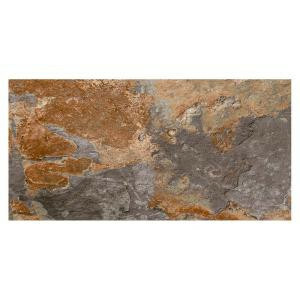 Buy online MARAZZI VitaElegante Ardesia 12 in. x 24 in. Porcelain Floor and Wall Tile (15.6 sq. ft. / case) ULRV1224HD1PR, leave review and share Your friends.